We are proud to announce the official release of SmartGit 8. The most important new features are the Journal, a focused view showing commits of the current branch, the tracked branch and one auxiliary branch, dark theme support for the text controls, commit message spellchecker and support for signing tags or commits. Check out What’s New for a more detailed list of improvements in versionÂ 8. SmartGit is a graphical front-end for the distributed version control systems Git which also can be used to work with Subversion repositories. SmartGit runs on Windows, Mac OS X and Linux. 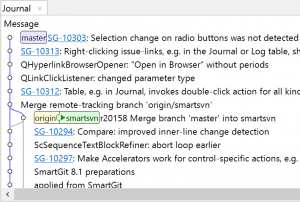 SmartGit can be used free of charge for non-commercial purposes (e.g. by OpenSource developers, students or certain wellfare institutions). For commercial use or if support is needed, you can purchase commercial licenses. The commercial licenses include up to 3 years of e-mail support and up to life-long free updates. For early adopters, we are offering up to 40% discount until September 15th 2016. Note: if you already have an existing installation of SmartGit and your license supports free upgrades, you will be upgraded during the next couple of days. The 2nd release candidate (RC) of the upcoming SmartGit 8 is available. The most important feature of SmartGit 8 is the Journal that replaces the previous Outgoing view and offers a focused and compact view onto the current branch, its tracked branch and one arbitrary branch. That way for most operations the Log dialogs or the Log are not required any more. SmartSynchronize 3.4.7 has been released adding some minor improvements and fixing a few bugs. 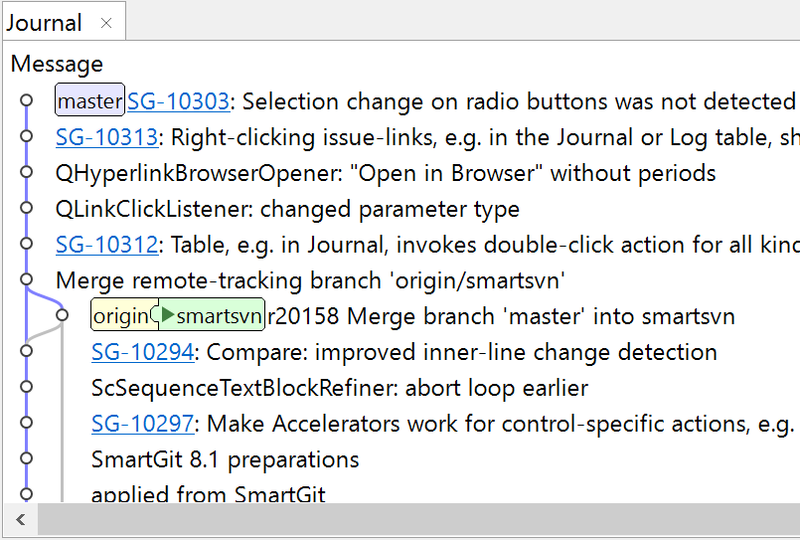 The 1st release candidate (RC) of the upcoming SmartGit 8 is available. This bug fix release fixes a couple of bugs. We recommend to update.